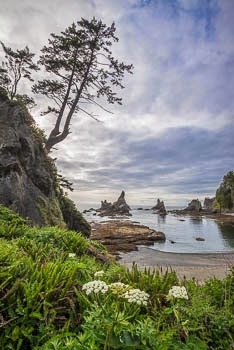 Life in profusion drapes the rocks at Shi Shi Beach. Heavy layers of mussels await the returning tide. 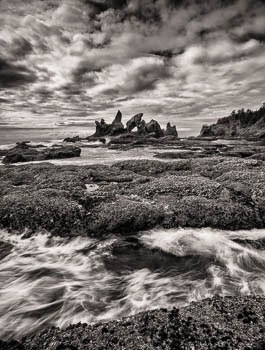 Shi Shi is a cacophony of beautifully sculpted rocks and a steep shoreline that the sea nests against when the tide returns. To the south, a wide crescent beach sweeps to the distant and rugged Point of the Arches. Due to a number of very dedicated people, these areas are set aside for posterity and saved from the continued taming of the wildness of our coasts. There are few visitors here for much of the year, but as the weather moderates, these beaches are greatly enjoyed by many. It's heartening to see many families backpacking here to enjoy this heritage. In spring, the weather changes daily, often hourly. One need only wait for change from sun to rain, with rainbows seemingly pressed against the cliffs towards evening. An eagle glides by. The rapid and humorous call of two oystercatchers landing. Another long beach expands to the south at Second Beach. A simple name for a magic place. 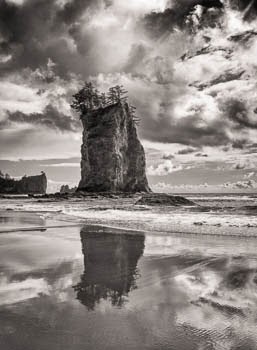 The Quileute name is Quateata. The hillsides along the beach show the difficulties of winter, with offset and jumbled trees from land sliding toward the sea. This day was restful and calm.